This dairy free macaroni and cheese recipe is made with the most incredible pumpkin-sage sauce that gets it's yummy creaminess from the soaked cashews that get blended it. A lay of herb infused panko breadcrumbs over the top add crunch! The perfect pasta casserole for fall! This melon and mint salad is my summer go to when watermelon and cantaloupe are at their peak ripeness. It's super simple and a portable side for bringing to barbecues. 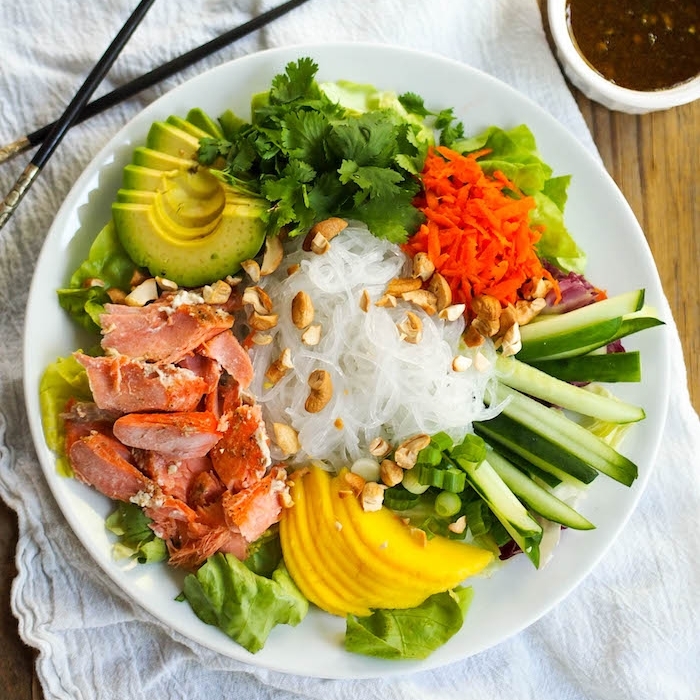 You can even turn it into a main dish salad by adding avocado and grilled shrimp! Skip the boring boiled carrots and make this recipe for roasted carrots with tahini, black olives and mint! Step up your side dish game with these baked purple sweet potatoes with miso butter! Loaded with antioxidants, fiber and flavor! Make your house smell like fall with these roasted fall vegetables served with a kale and hazelnut pesto! Perfect for Thanksgiving! 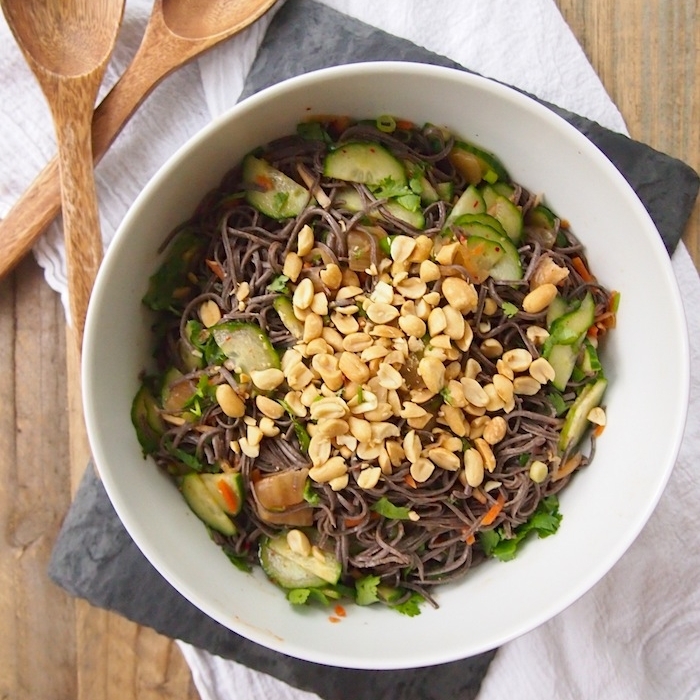 Sesame soba noodles! 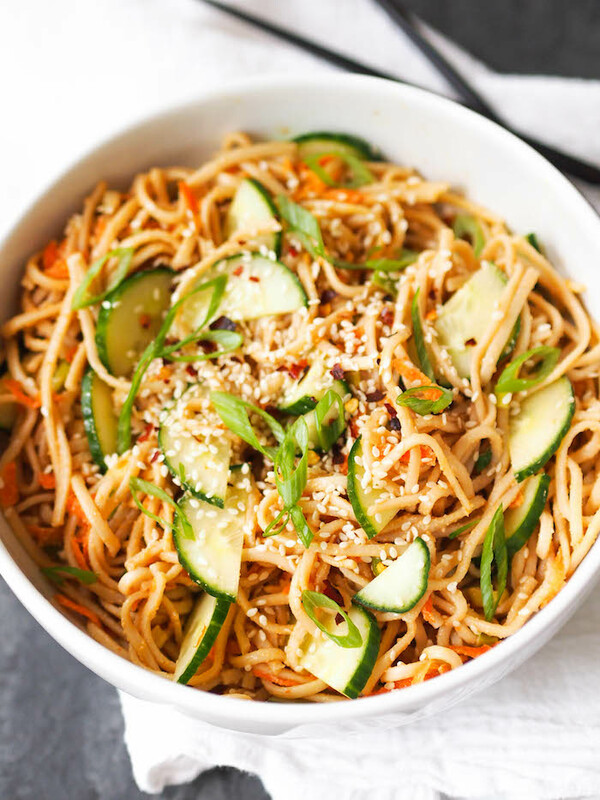 Toss whole grain soba noodles in a creamy tahini sauce then add crunchy carrots and cucumbers to make this cold Asian salad. Oh hayyyyy there sesame noodles. Don't worry, we'll come back to you. But first, let's talk Olympics. Tell me, are you watching? What's your favorite sport? It's badmitton, isn't it? ;) I'm typing this while watching women's gymnastics qualifiers. Sidebar - Simone Biles OMG!!! How does your body do these things? I literally do not understand. So back to these sesame noodles. I'm a huge fan of Asian noodle salads. It's all the things I want in the summer. Salads and substance. You'll want to find soba noodles if you can. One hundred percent buckwheat are my jam, and gluten free too for those who must avoid, but the whole wheat or mixed buckwheat and wheat are easier to find and work just fine. Regular spaghetti also works in a pinch. This sesame sauce is the bestest. Most sesame noodles use sesame oil as a dressing, but sometimes that gets a bit greasy. So I used tahini, which was almost like a peanut satay sauce. Actually, you could probably use peanut butter instead of tahini and it would be equally amazing. To round it out, add rotisserie chicken or baked tofu cubes. You could also serve it over a bed of lettuce for more green. Bring a large pot of water to a boil. Cook soba noodles according to package instructions. When cooked, drain and rinse with cold water. While noodles are cooking, whisk together tahini, sesame oil, soy sauce, brown sugar, rice vinegar, and sriracha. 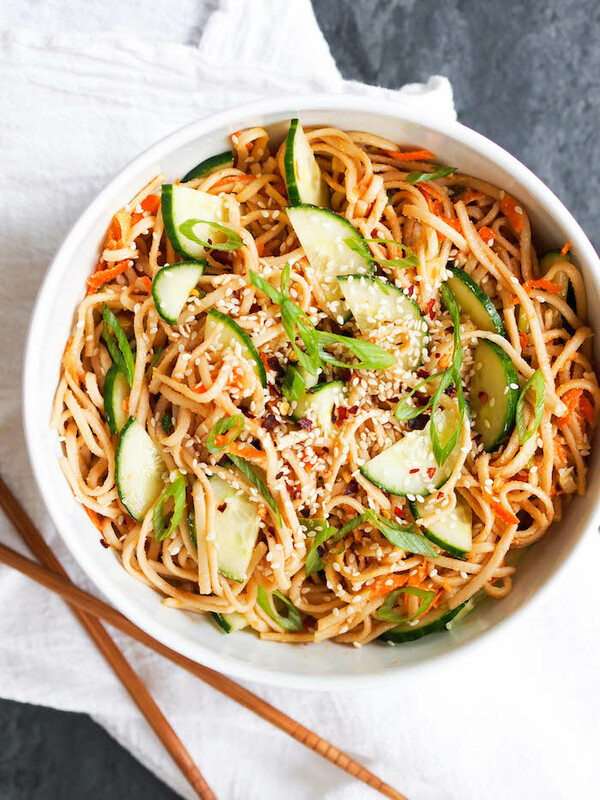 Toss noodles in a large bowl with dressing, scallions, cucumber and carrots. Serve room temperature or chilled. Zoodles with creamy vegan pesto and roasted tomatoes make the perfect light lunch or side dish! Add white beans or diced chicken for protein, or mix with regular noodles for carbs to make it a filling main! It's official guys. I am the last person on the planet to get a spiralizer. I held out for a long time, since our kitchen storage has now expanded to include the living room. The last thing I needed was another piece of equipment collecting dust next to my fondue pot. I even politely declined when my little brother said he was going to get me a spiralizer for my birthday last April (the rest of the spiralizer owning world is screaming "Whaaaat?! Are you insane??" right about now). After slicing my finger open on my mandolin for the 347th time, I finally gave in. It was right before Christmas so I put in on my list and was gifted it for real from my very sweet little brother. Life has not been the same ever since. Okay, it's been exactly the same, but with more zoodles. In case I am incorrect and am not the last person on the planet to get a spiralizer, and you in fact are, let me sell you on it. The spiralizer easily cuts your fruits and vegetables into long, curly, ribbons of "noodles." I don't know why, but they actually taste different, and better, when you cut them this way. The possibilities are endless. You can spiralize a cucumber and toss with an Asian style dressing and tofu cubes. You can spiralize sweet potatoes and use them as a base for a creamy pasta sauce. You can spiralize red onions, peppers and cabbage to make an extra pretty slaw. Seriously, just go ahead and google spiralizer recipes and loose the next 2 hours of your life on pinterest. This dish is a pretty classic zoodle recipe. I decided to go for an extra creamy pesto sauce by adding soaked cashews. I love that it adds a little protein to the dish too! If you're not eating it right away, be sure to pack your noodles and sauce separately, otherwise the salt from the dish will turn your beautiful zoodles into a watery mess. 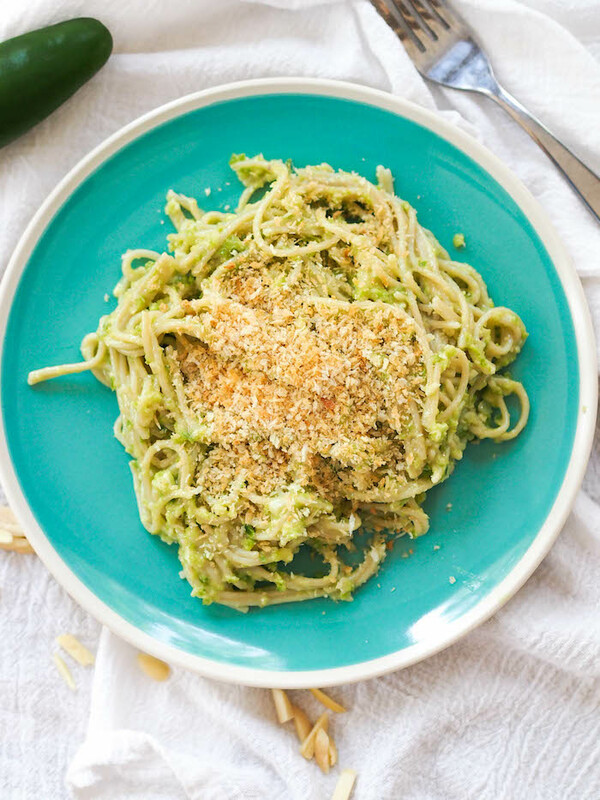 Although the cashews do add some protein, these zoodles with vegan pesto are pretty low in protein and carbs! If, like me, you're not a fan of feeling super hangry an hour after eating, try adding some white beans or diced chicken for extra protein and mixing the zoodles with some normal noodles for some carbs to keep this a balanced meal! Preheat oven to 300 degrees. Toss tomatoes with olive oil, season with salt and pepper and spread evenly on a large baking sheet. Roast 40 minutes until slightly shriveled and some of the juices are released. Remove and set aside. While tomatoes are roasting, make the pesto. Place the shallot and garlic in a food processor and pulse until finely minced. Add cashews, basil, nutritional yeast and olive oil. Blend until very finely chopped, scraping down sides as needed. Add water, season with salt and pepper and blend until creamy. Toss raw zucchini noodles with tomatoes and pesto and serve garnished with hemp seeds if desired. This shop has been compensated by Collective Bias, Inc. and its advertiser. All opinions are mine alone. #EntertainandPair #CollectiveBias The following content is intended for readers who are 21 or older. 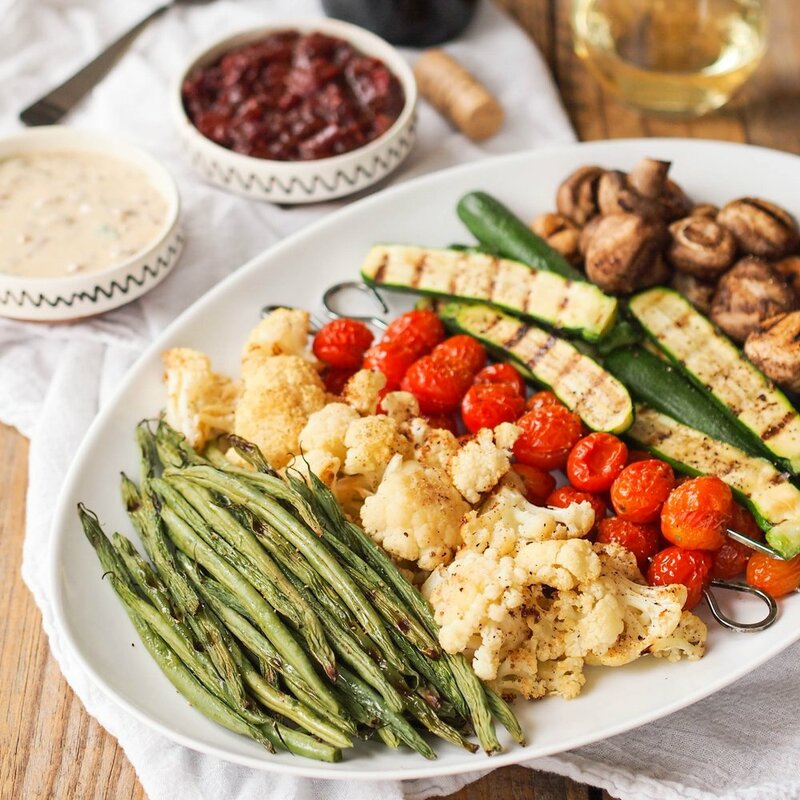 This grilled vegetable platter served with a red wine tomato jam and caramelized onion buttermilk dip, both infused with Dreaming Tree Wine, is the red carpet version of your standard raw vegetable platter! Admit it. You've been that person who brings a raw vegetable platter to the party in an attempt to have a healthy option for everyone to enjoy. Except, no one actually enjoys that raw vegetable plate. Some eat it because it's there, but who has ever left a party saying "Wow! That baby carrot dipped in ranch was amazing! I wish Susan would share her recipe!" This awards season, give your standard raw vegetable platter a red carpet makeover. My secret for a vegetable platter people will actually want to eat? Grill (or roast) the vegetables first, adding a caramelized, smoky flavor, and serve alongside a couple tasty, homemade dips. Usually I do some type of hummus or avocado-based dip, but for this campaign, I decided to experiment cooking with Dreaming Tree wine...and I think I found two new favorites in the process! Both get a deep, rich, and luxurious flavor from a base of caramelized onions infused with Dreaming Tree wine. The jammy notes of Dreaming Tree Crush, a red wine blend, went perfectly in the tomato jam, adding a layer of fruitiness and complexity. For the buttermilk dressing, I went with Dreaming Tree chardonnay. Now, normally I'm not a chardonnay person. Actually, I rather despise chardonnay, which is why it was the only Dreaming Tree wine I hadn't tried. But I thought chardonnay's buttery flavor would go really well with the caramelized onions over the crisp, more acidic everyday white (which I love for sipping!). So glad I picked it up though, because I discovered I really like their chardonnay! Like, a lot! It's aged in both stainless steel and oak barrels, so it's not overly oaky and cloying like the other chardonnays I've tried. As a long time fan of Dreaming Tree Wine, I was particularly excited about the project. As an even longer time fan of Dave Matthews (high school flashbacks! ), who launched Dreaming Tree with winemaker Sean McKenzie, I picked up a bottle almost as soon as it launched and it's been a favorite ever since. Outside of the flavor (Crush is my favorite) and high quality for a reasonable price, I really appreciate their commitment to sustainability. It's a Certified California Sustainable Winegrowing winery and has the largest solar initiative in the wine industry. The wines are even packaged sustainably, using less glass and a recycled label. Considering we're smack dab in the middle of awards season, I think you'll have plenty of opportunities to whip this up. Usually I'm not big into award season, but this year, we've kept up with most of the nominees and I definitely have my favorites...which I won't share, because after they win I like to say "I knew it! I totally called it!" ;) So, I'm thinking we may have people over to watch and put out this grilled vegetable platter along with a selection of cheeses and crusty bread. 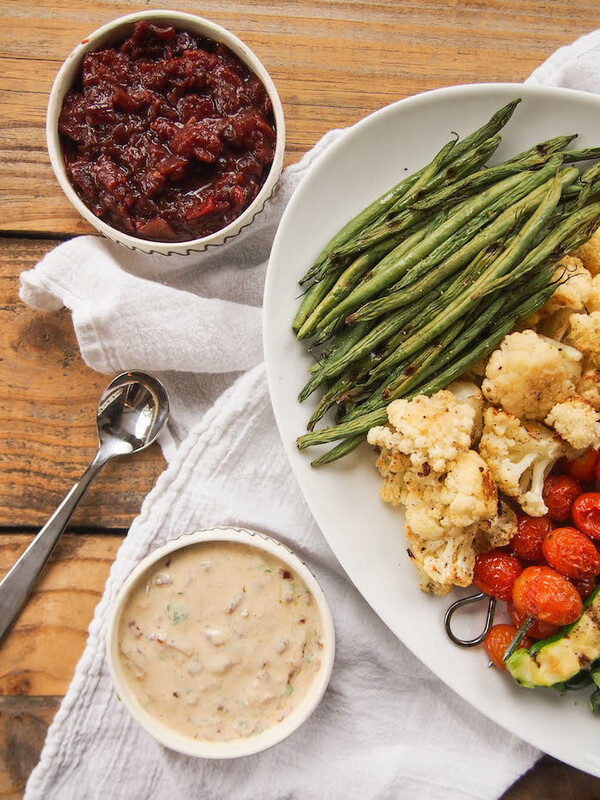 Although this might seem like more effort than a premade vegetable platter, leftovers can easily be stretched into meals during the week. Serve the leftover vegetables in a grain bowl. Leftover buttermilk dip is perfect in my collard green salad with cornbread croutons or your favorite simple side salad. The tomato jam would be so tasty served over roasted fish or a grilled steak, or even on a sandwich. And of course, the leftover wine is perfect for sipping and pretending to be fancy during your very own awards party! For more inspiration on how to #EntertainandPair, head to their website. Be sure to check out your local retailer for wine tasting demos! What are your favorite red carpet bites, and which Dreaming Tree Wine would you like to pair it with? Use any fresh vegetables you like. I used cherry tomatoes (on a skewer), cauliflower florets, halved baby zucchini, mushrooms and green beans. If you prefer roasting, toss them with a tablespoon of olive oil and roast in a 400 degree oven until golden and tender. Set grill to medium high. Spray vegetables with olive oil and season with salt and pepper. Place on the grill and cook until lightly charred, but still crisp-tender. Keep an eye on them to prevent burning. Heat olive oil on medium heat in a medium pot. Add red onion and garlic and saute until starting to get golden, about 7 minutes. Add a sprinkle of salt and continue to cook over medium heat until deeply caramelized, tender and almost jammy looking, about 40 minutes. Pour in wine, scraping up the bottom with a spatula. Add tomatoes, balsamic, brown sugar, and red pepper flakes. Season with salt and pepper. Bring to a simmer and cook until very thick and jam-like, about 15 minutes total. Taste and season with more salt and pepper if needed. Heat olive oil on medium heat in a medium skillet. Add onion and garlic. Saute until starting to look golden, about 7 minutes. Sprinkle with salt and continue cooking, stirring every so often, until onions are deeply caramelized and jammy in appearance, about 40 minutes. Stir in wine, scraping up bottom of the pan with a spatula, and cook until wine is almost completely reduced and the onions are very jammy in appearance, about 5 minutes. Turn off heat, scrape onions into a bowl, and set aside to cool slightly. When onions have cooled a bit, stir in buttermilk, olive oil, parsley, vinegar, and garlic. Season with salt and pepper. Taste and add more if desired. Maple miso glazed brussels sprouts were made for Thanksgiving...or every day of the week! If you couldn’t already tell from my Instagram feed, I’m having a bit of a fall moment. I’ve always enjoyed the season - the changing colors, college football, finally being able to straighten my hair. While I’m not quite to the level of posting selfies in Uggs with a pumpkin spice latte in hand, I totally get the enthusiasm. This year fall seems to be a little bit more magical than normal. When we left Columbia for Vietnam, it had been hot and rainy and dreary for the past couple weeks. When we got back, we were smack dab in the middle of fall. I missed the transition entirely, and I’m not sad about it in the least. Obviously, we’re celebrating fall in the kitchen. Maybe in a few months I’ll start missing eggplant and heirloom tomatoes, but for now, I’m playing a game called ‘let’s see how many ways I can prepare Brussels sprouts.’ Come join me! Brussels sprouts are a must have on Thanksgiving, right up there with mac and cheese and stuffing. Wow, I never thought those words would come out of my mouth. Brussels were far from my favorite vegetable growing up. Now they crack the top three. These maple-miso brussies (my nickname, because we’re best pals and all) would make a lovely little addition to your Thanksgiving meal. Be sure to use pure maple syrup, not pancake syrup, which is simply sugar syrup with maple flavor. Bonus points for grade B pure maple syrup, which has a much deeper flavor. Heat olive oil in a large skillet on medium high heat. Add brussels sprouts and cook until lightly browned, about 3-5 minutes. Add 1/3 cup water, cover and cook until tender, about 5 minutes. While sprouts are cooking, whisk together maple syrup, red pepper flakes and miso paste in a small bowl. Taste the sprouts to make sure they're tender. Add glaze, stir to combine. Cook 1 minute then remove from pan to serving dish. Roasted summer vegetables are delicious on their own, but even better with a bright and flavorful Southern romesco. One can never have enough recipes for good 'ole caramelized and tender roasted veggies. "I get that I should be eating more vegetables, but how do you make them taste good? Let me count the ways. You could top them with garlicky breadcrumbs, season them with a little bit of bacon, add dried fruit, grill 'em, serve them with a creamy vegan dipping sauce, fritter 'em, add smoky and spicy flavors. Or, you could keep things simple and roast them. I want to point out a special vegetable in this mix - okra. It's definitely a polarizing veg. Okra detractors might call it slimy, or worse, mucusy, while okra lovers appreciate it's ropiness, ability to thicken stews (jambalaya! ), and hold on tightly to breadcrumbs before baking. I get the texture issues. Okra definitely has a unique one. But this is where roasting works it's wonders. Cut in half and roasted, or even left whole, the goo dries right up! Now, this Southern romesco? Just do it. You probably will have some leftover with this recipe, although I didn't, probably because I dropped giant globs of it all over my veggies and maybe snuck in a food spoonfuls while photographing. I really wish I doubled up the recipe. Extras would be perfect on a veggie panini, tossed with whole grain pasta and grilled veggies. dolloped on my creamy mashed beans, or with scrambled eggs. You could even use it as a snack or appetizer and serve with whole grain crackers and crudites. Place black eyed peas and bay leaf in a medium pot and cover with water. Bring to a boil, reduce heat, cover and simmer for 30-60 minutes until tender. Drain and set aside. Preheat oven to 400 degrees. First, roast the vegetables for the romesco by tossing the tomato, peppers, red onion, and garlic with olive oil. Season with salt and pepper. Roast 15 minutes until tender then remove from oven and set aside. Toss okra, onion, squash and cherry tomatoes in a large bowl with olive oil. Season with salt and pepper. Spread evenly on 2 large baking sheets and place in the oven. Roast 20-30 minutes until tender and golden, tossing halfway through cooking. Remove from oven and toss with black -eyed peas. Place vegetables for romesco in the food processor with pecans, sherry vinegar and salt and pepper to taste. 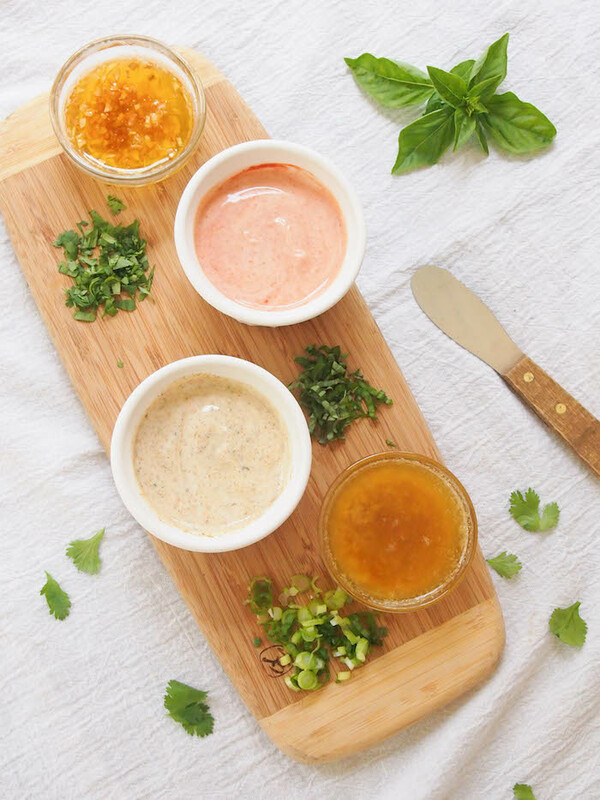 Serve vegetables dolloped or tossed with romesco with fresh basil. Enjoy antioxidant rich cherries in this gorgeous seasonal salad of dark cherries and crispy prosciutto with balsamic vinaigrette. I used to think I wasn't a fruit person. After each grocery trip, I would ambitiously fill my fruit basket...and a week later I hadn't made a dent. That was until I learned the gloriousness that is seasonal produce. Living in South Carolina, of course I have to say peaches are my favorite. But I suppose if I'm being completely honest, it's cherries. Clients often ask my choice for healthiest fruit and I always reply berries. However antioxidant rich cherries should be right up there with them! To learn more about the health benefits of cherries and get the recipe for this salad, head over to the Healthy Aperture blog! Summer corn is a bit of a religion in our house. Like tomatoes, it's one of those vegetables that should really only be consumed in season. If you've tasted fresh summer corn, just picked and straight off the cob, then you understand. After corn is picked, the natural sugars start to convert to starch and the corn loses it's sweetness. My husband's long commute to work takes him past acres of cornfields and each summer, he gives me daily updates on it's progress. As soon as it's ready, we eat grilled corn at least once a week. Something about those lightly charred, sweet kernels gets me! Have you tried Mexican street corn? It's my absolute favorite way to eat it! But slathered with cheese, mayonnaise and crema, it's not exactly the most nutritious. When I got a shipment of Amaize sweet corn, I decided to play around and come up with some healthier grilled corn toppings. Between the flavor packed garnishes and naturally sweet Amaize corn, we were in heaven! My South Carolina friends can find Amaize corn at Food Lion through August. (Disclosure: This post was not compensated. I received samples of Amaize sweet corn, loved it and wanted to share with you fabulous readers!). Heat a grill on medium-high. Place the corn directly on the grill and grill about 10 minutes total until charred on all sides. 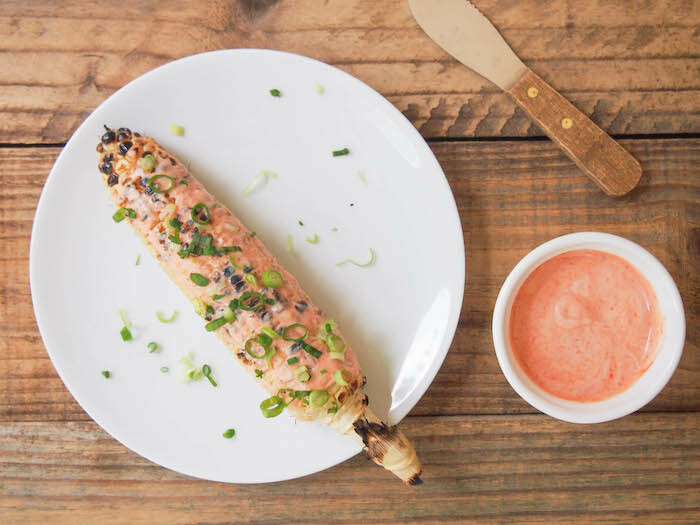 While corn is grilling, mix yogurt and sriracha. Slater over corn. Garnish with lime and green onion. While corn is grilling, warm butter, sesame oil and miso in a small skillet. Whisk together until combined. Serve corn drizzled with warm butter and garnished with sesame seeds. While corn is grilling, whisk together yogurt and curry. When corn is done, slather with curry yogurt and garnish with cilantro. While corn is grilling, warm butter and garlic together in a skillet on medium heat. When butter starts to smell nutty and garlicky, turn off heat and remove skillet from stove. Serve corn with garlic butter and sliced fresh basil. Crispy kale, black rice and coconut salad is a healthy, fiber packed lunch, perfect for topping with seared tofu or roasted salmon. Did you happen to catch that article circulating facebook claiming kale is a "silent killer"? I know. Insert eye-rolling emoji. When I saw it posted on my feed, I immediately dismissed it because, well, duh. Kale is kale. A few days later, I saw the rebuttal, which of course I clicked on. Gotta love a good science takedown! Basically, the research behind the whole 'kale is toxic' claim is flimsy at best, but more accurately, nonexistent. Read it yourself. How such horrific science was spun in a fairly reputable media source will definitely make you look at nutrition headlines differently. Rest assured, kale is perfectly nutritious, and while theoretically, any food can be dangerous if consumed in excessive quantities, that's pretty low on my list of concerns. So go ahead, throw some kale leaves in your smoothie, saute it, whip up a big ole' kale salad. You'll be eating one of the most nutrient dense foods out there, and you may even feel happier for it! Thats right, because kale is a Good Mood Food! Kale certainly has a cultish following among the health conscious and food lovers in general. It can be a bit much, but I must say, the reputation is deserved. Kale tops the charts when it comes to nutrient density. As one of the most nutrient dense foods, kale is rich is brain boosting nutrients! MAGNESIUM // A deficiency in magnesium has been linked to anxiety, depression, ADHD and fatigue. Unfortunately, almost 70% of Americans don't eat enough magnesium. Magnesiums role in psychiatric conditions isn't well understood, partly because magnesium has so many complex roles in the brain - regulating neuronal function, optimizing thyroid function (an underactive thyroid can cause depression), reducing inflammation, as a precursor to neurotransmitters...I could go on. Or you could go eat some kale, which contains a hefty dose of magnesium and is one of the greens lowest in oxalates, a compound in many green leafy vegetables that can interfere with magnesium absorption. CALCIUM // Calcium does more than build healthy bones! Calcium plays many roles in the regulation of neurotransmitters and the electrical impulses in our brain. There are many plant based sources of calcium, including leafy greens. A serving contains 9% your daily needs. VITAMIN A & VITAMIN K // Two of those fabulous fat soluble vitamins we were missing out by following the low fat craze of the 90s. Vitamin A plays a role in creating the enzymes that make neurotransmitters while vitamin K makes fats called sphingolipids that make the structure of our brain. A serving of kale contains 200% daily needs of vitamin A and a whopping 600%+ daily needs for vitamin K.
I'm a huge fan of eating kale in salad form. The sturdy kale leaves won't wilt so you can whip up a kale salad that will last all week, dressed and all. To tenderize the leaves so I don't spend my entire lunch break chewing, I massage the dressing in. It can get a little messy and as much as I love to play with food, it's one task I'm happy to skip. When I first tried this salad from Super Natural Everyday I fell in love, not just with the salad itself, but the ingenious method for softening kale leaves by roasting them with a flavorful dressing. Straight out of the oven, some of the kale leaves are nicely wilted while others get crispy. Basically, it's a kale chip salad. I know! And although you lose the crispiness with leftovers, it's still pretty fantastic. To boost the brain power, I served this with salmon roasted in sesame oil, soy sauce and spritzed with a little lemon juice, but feel free to make it vegan with baked cubes of tofu or even extra hemp hearts, which are high in protein. You could also swap the black rice for more readily available brown rice, or other whole grains like farro, quinoa, or bulgur. Adapted from Super Natural Everyday by Heidi Swanson, one of my favorite vegetarian cookbooks. Bring 2 cups of water to a boil with black rice. Reduce heat, cover and simmer 50-60 minutes until rice is tender and water is absorbed. Preheat oven to 350 degrees. In a medium bowl, whisk together olive oil, sesame, soy sauce, garlic and cayenne. Spread chopped kale evenly across two large baking sheets. Toss with coconut. Drizzle with about 3/4ths of the dressing. Place in the oven and bake 12-18 minutes until the coconut is golden and the leaves are slightly crispy around the edges. You may need to swap the pans positions in the oven (from upper to lower rack and visa versa) halfway through cooking. Remove kale from the oven and transfer to a large bowl. Add black rice, remaining dressing and toss to combine. Serve warm. 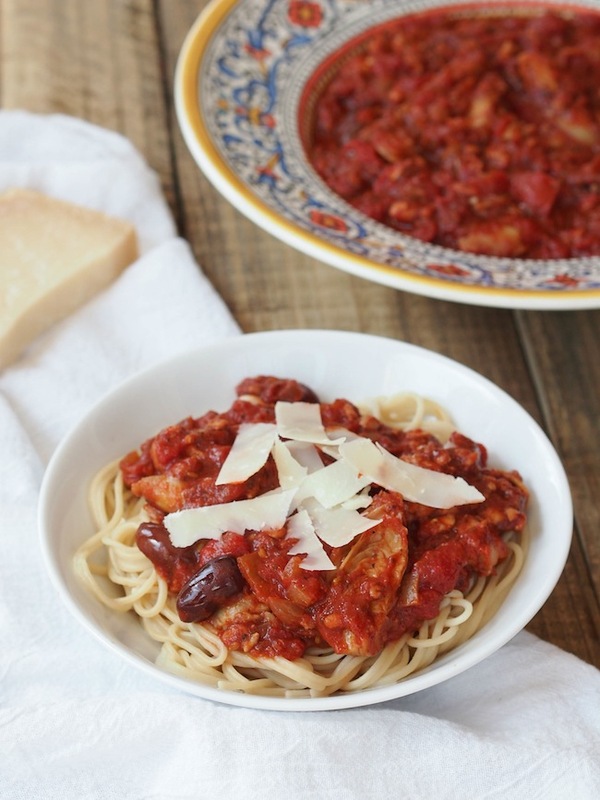 Leftovers can be enjoyed cool or reheated slightly. Homemade fermented pickles are an easy vegan source of probiotics and a great way to preserve summer's produce. Learn how to make your own, plus recipes for fermented spicy dill pickles, fermented pickled green tomatoes and jalapeno slaw. Fried black rice with bok choy is a quick, easy and nutritious meal, packed with whole grains and seasonal vegetables. I aim to do at least three of these things each Sunday. It doesn't always happen, but even if I cross just one item off the list, it makes a huge difference in simplifying and streamlining my week. Ever since I got an electric pressure cooker last year, which cooks grains in 15 minutes and beans in 30, there's no excuse not to whip up a batch to last all week. You'll find a million things to do with a big batch of cooked whole grains. Pour in almond milk, honey and fresh fruit for breakfast. 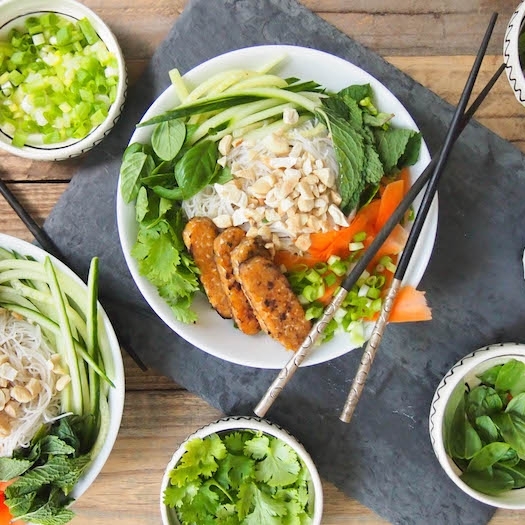 Whip up a grain bowl with leftovers and random bits hanging around the fridge. Toss in olive oil and fresh herbs for a simple side dish. But who am I kidding? 99.9% of the time I make fried rice. I have endless love for fried rice. From the authentic versions at my favorite restaurants to the uber-greasy Panda Express at the mall version, I love it all! It couldn't be easier to make homemade fried rice. I rarely follow a recipe, but for the sake of sharing, I wrote down this one today. Basically I saute onion, garlic a seasonal vegetable in oil, usually olive or sesame, add cold cooked brown rice or some other whole grain, then scramble in an egg. It's as easy as that! Just be sure to use cold rice, otherwise it will get mushy. For this recipe, I used black rice, also called forbidden rice. It's black when raw, and a dark purple-ish color when cooked. It's hue comes from anthocyanins, the same type of antioxidant that gives blueberries, blackberries and other purple fruits & veg their color. Anthocyanins have been shown to protect against diabetes, cancer and heart disease. And actually, black rice has almost as much anthocyanin as blueberries and blackberries! You can purchase it online or at most health food stores and well stocked grocery stores, where it's often sold in bulk. Heat oil in a large sided skillet on medium high heat. Add onion, carrots and garlic and saute 5 minutes until translucent. Add bok choy and chili flakes, saute until stems are tender and leaves are wilted. Stir in rice, let sit for a minute to crisp, then toss. Repeat until rice is slightly crispy, about 10 minutes total. Add scallions and soy sauce and toss to combine. Remove rice to a serving bowl. Reduce heat to medium. Add sesame oil to the empty skillet. Pour in beaten egg. Scramble egg by pushing in sides towards the center until cooked through, then break apart with a spatula. Stir eggs into the rice. Serve garnished with peanuts. Kimchi noodle salad is a delicious way to sneak in mood boosting probiotics, and it takes less than 30 minutes to make. Vegan and gluten free too! Happy Friday! I'm excited to share the first post of my new series, Good Mood Food. As you know, I'm a firm believer that food can and should contribute to a healthy and happy life. 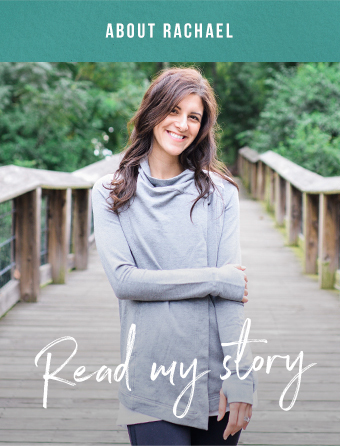 In this series, I'll be highlighting foods that have a specific impact on brain health, and mood and using it in a tasty new recipe. For my first post, I want to look in depth at a group of foods essential to mental health - fermented foods. Fermented foods have been preserved or produced by the action of microorganisms like bacteria and yeasts, which digest sugars, turning it into gasses, acids or alcohol...I know, I'm not really selling it. But trust me, fermented foods are much tastier than it sounds, and they've been an essential part of the human diet for thousands of years. And guess what? If you've had yogurt, sourdough bread, sour cream or soy sauce, you've already swallowed a nice little mouthful of bacteria. Fermented food is important for health because it introduces and replenishes the supply of probiotic bacteria to our gut. Did you know we have more bacteria in our gut than cells in our body? In fact, our gut bacteria outnumbers our cells 10 to 1. So, I guess we kind of are what we eat! Having a healthy intestinal flora is important for more than digestion. Studies have shown how changes to our intestinal bacteria can effect weight and have an impact on cardiovascular health and bone health. But what I find most notable and fascinating is how fermented foods improve mood. You probably think of your brain as this intricate and complex organ and your gut as, well, a poop shoot. But you could argue that our gut has almost as much influence over our thoughts and mood as the brain. The gut is home to the enteric nervous system (ENS), the second greatest concentration of nervous system cells outside the brain. Many scientists refer to the gut as "the second brain." While the gut can't think, per se, it does influence thoughts and mood in other ways and one of those ways is through our gut bacteria. Gut bacteria produces neurotransmitters, including 95% of the bodies serotonin and about half the bodies dopamine. Serotonin is often called the good mood hormone and dopamine is part of the reward system. Gut bacteria also protects against an endotoxin called lipopolysaccharide, which even small increases of can provoke depressive symptoms (and increase blood sugar). Fermented foods also decrease inflammation in the gut. Mild inflammation in the gut has been shown to increase anxiety and and lower levels of brain derived neurotropic factor, a neuropeptide that's known to be low in depression. If you'd like to read more about the science behind it, here's a fascinating journal article that looks into the science of mental health and fermented foods. Kimchi might be my favorite fermented food. I'm slightly addicted. If you ever catch me hanging out in front of the refrigerator with the door wide open, it's probably because I'm eating kimchi out of the jar (or peanut butter, but that's another post). Kimchi, made by fermenting cabbage in chili paste, is essential to Korean cuisine. It's used to flavor soups, stews and in fried rice or is eaten as a side dish. I know fermented cabbage might not get you excited, but trust me, it's incredible! Think of it as spicy saurkraut! This dish is a great way to enjoy kimchi in all of it's raw, probiotic filled glory. To make a full meal, add some type of protein. We tossed in pieces of grilled local chicken breast seasoned with 5-spice powder. Or for a vegan version, use edamame, cubes of baked tofu, or sprinkle it with extra peanuts or hemp hearts. Toss in edamame, cooked chicken or baked tofu for additional protein. Cook noodles in a large pot of salted water according to package instructions. Drain. Drizzle in 1 tablespoon of sesame oil to prevent it from clumping. Set aside to cool. When noodles are room temperature, place cucumber, kimchi, scallions and cilantro in a large bowl. Add noodles and toss to combine. Drizzle remaining sesame oil and sriracha/gochujang over the top. Toss again to combine. Top with toasted peanuts.